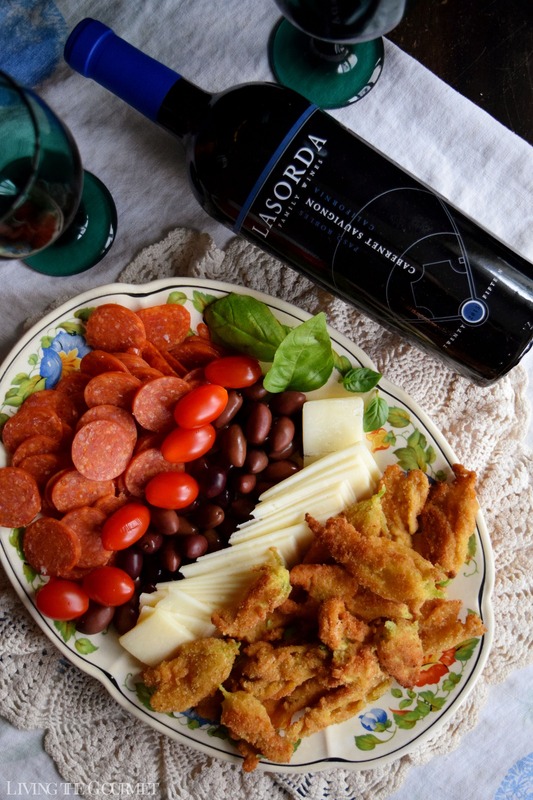 This post has been sponsored by Lasorda Family Wines. The following message is intended for persons 21+. All opinions expressed are my own. 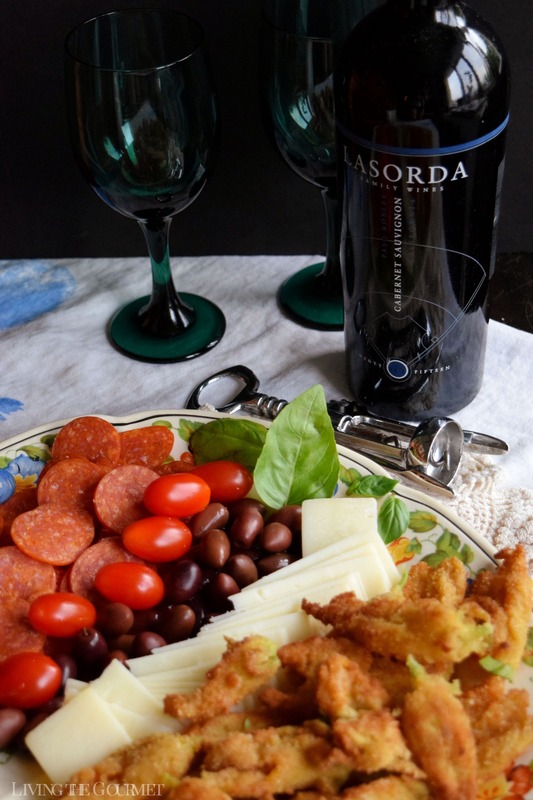 Dress up your summer tablescape with these easy, elegant Fried Zucchini Blossoms and a glass of Lasorda wine! There’s a cliché that runs roughly “What would you do if you know that you were guaranteed success?” In other words, in the absence of the fear of failure, what are you passionate about? It’s the sort of ‘power motto’ that you see plastered on the walls of Silicon Valley tech headquarters or recited at business meetings, where this sentiment breaks down barriers to innovation and creativity while encouraging calculated risk-taking. On a more material level, however, we see answers to this question in the form of ‘Passion Projects.’ Think of the long line of comedy greats who tried their hands at ‘serious’ roles, or of the countless authors who attempted write under pseudonyms for the purpose of ‘putting to page something meaningful,’ and so and so forth. 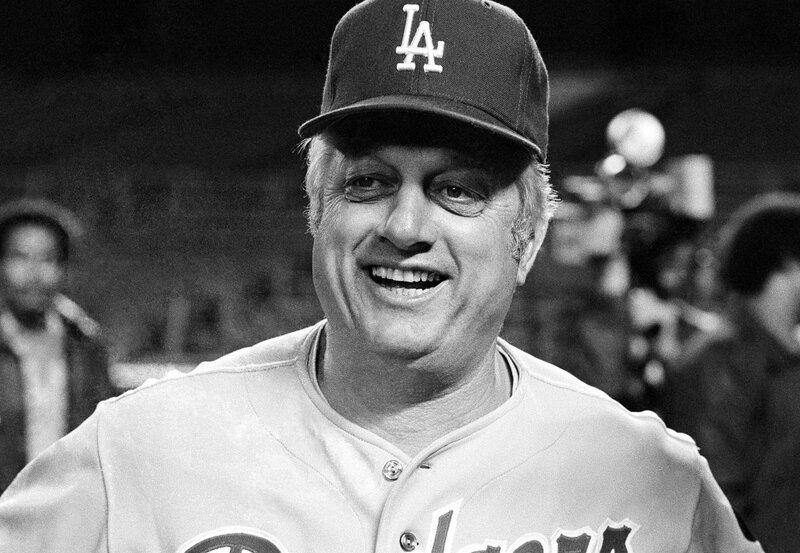 Former baseball great Tommy Lasorda, for example, developed a taste and passion for wine early in his life, and following his career on the diamond, he put that passion to practice in the form of Lasorda Family Wines – who contacted me early last month asking if I would be interested in reviewing one of their bottles. Naturally, I agreed and received a 2015 Cabernet Sauvignon from the Paso Robles AVA in California. With the formalities out of the way, let’s see how the wine itself fairs – and if passion has transformed itself into success. 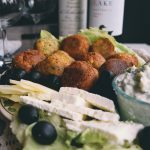 To start, the wine introduces itself with a bouquet that I’ll describe as ‘dark,’ featuring sliced blackberry notes, which are grounded firmly in earthy tones of dry driftwood or antique oak or cedar. Deeper into the glass, notes of chocolate and perhaps just a hint of spice become discernable. On sampling, the wine becomes a very ‘by the book’ sturdy cabernet, featuring a rich and full mouthfeel carrying an assortment of dark berries such as raspberry and currants, framed in ever-present earthen qualities, which translate into a long and pleasant finish. For pairing, think prime rib roasts, sirloin, spicy red sauces over pasta, and herbed shark steaks. This could also pair nicely with an aged cheese platter accompanied by artisan bread with infused oil. In 3 separate bowls, divide the flour, egg wash and breadcrumbs. 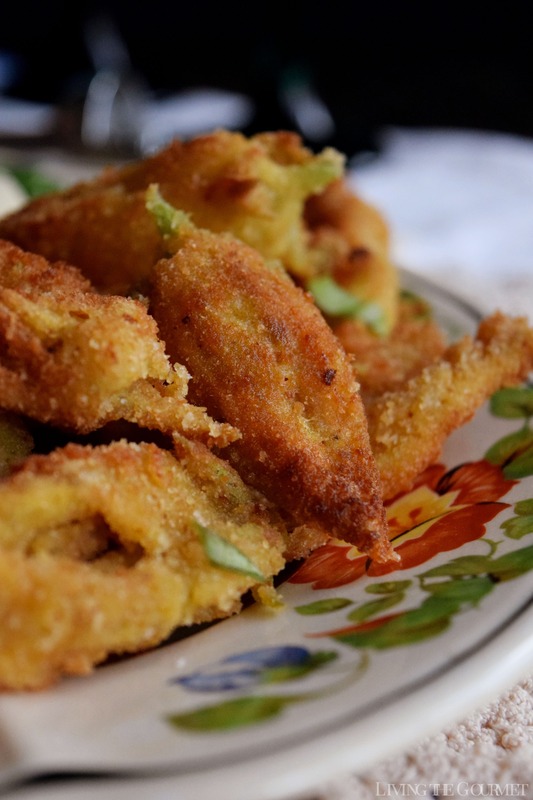 Dredge your zucchini blossoms in the flour, egg wash then breadcrumbs and place on lined baking sheet. Heat a cast iron skillet with ½ –inch of vegetable oil. Be sure not to overcrowd the pan with the blossoms. Fry each blossoms for about 2 minutes on each side or until golden. Transfer the fried blossoms to a plate lined with paper towels to absorb any excess oil. 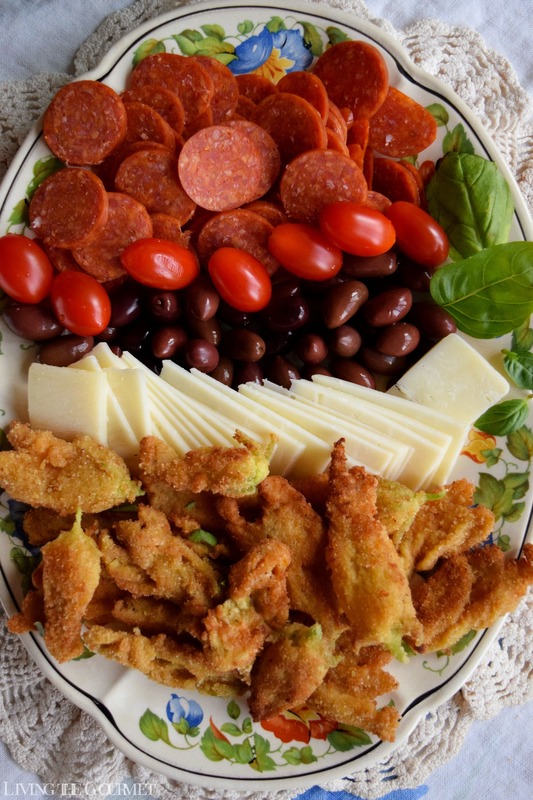 Sprinkle with parmesan if desired and serve alongside your antipasto platter or with our favorite pasta dish. Enjoy! 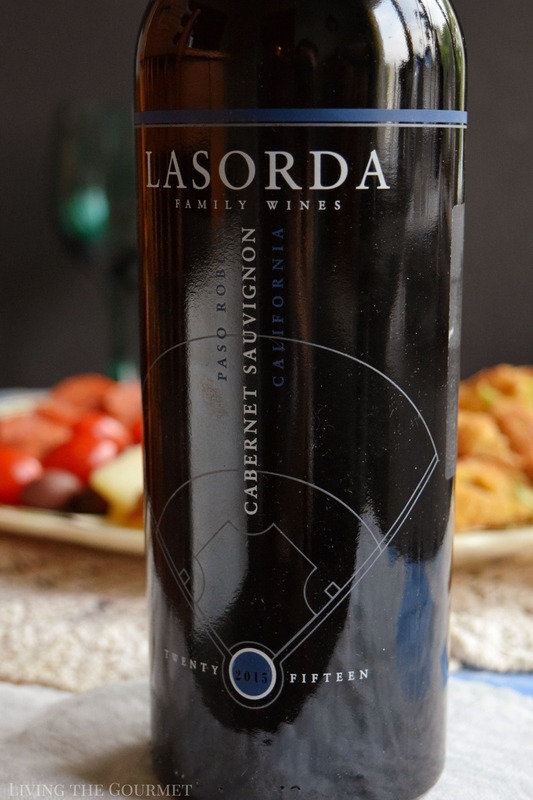 Overall, I was very pleased with Lasorda Wines, and can wholeheartedly recommend it to my readers. Oh how I wish I lived in an area where I could get zucchini blossoms...I always order them if I find them on a restaurant menu. Fabulous!!! 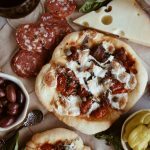 I first tasted these in Tuscany decades ago. Now I'm craving everything on that gorgeous platter!